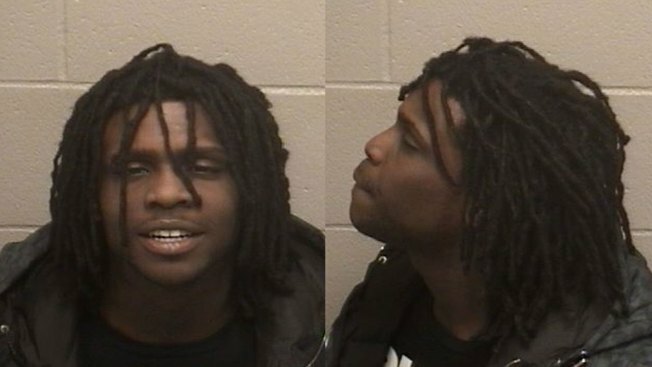 Chicago rapper Chief Keef missed a court hearing Friday for a municipal traffic ticket for driving under the influence of marijuana, spurring a Lake County judge to issue a $50,000 bench warrant for his arrest. Judge Veronica O’Malley issued the warrant after the rapper, whose real name is Keith Cozart, missed a scheduled appearance in misdemeanor court Friday morning, according to Cynthia Vargas of the Lake County State’s Attorney’s Office. Cozart has pleaded not guilty to charges of driving under the influence of marijuana in Highland Park. The violation is a Class A misdemeanor carrying a potential penalty of up to 364 days in jail, Vargas said. His case is being prosecuted by the city of Highland Park rather than the Lake County State’s Attorney’s office. It's not clear who was shot, who pulled the trigger or whether the young Chicago rapper was present. Charlie Wojciechowski reports. Cozart was pulled over about 12:40 a.m. March 5 in the 2600 block of Skokie Valley Road after officers noticed he had an expired registration on his 2010 Jeep Grand Cherokee, police said. Officers who approached the car said Cozart appeared impaired by drugs, and that they could smell burnt marijuana coming from inside the car, according to police reports. Cozart failed a sobriety test and was taken into custody. Prior to his Highland Park arrest, Cozart had spent time in California serving a 90-day court-mandated rehab sentence after he pleaded guilty last year to testing positive for drugs while on probation. He is also being sought on a statewide warrant issued July 14 in Cook County for child support he owes, according to sheriff’s office spokeswoman Sophia Ansari. That warrant carries a $10,000 cash bond.